Learning and innovation go hand-in-hand; while learning is characterized by a change in behaviour, innovation involves a change in the thought process. Both imply a change for the better. Today, as information and communication technologies are increasingly part of the educational landscape, new means of accessing, sharing, and collaborating with knowledge have challenged us to reflect how we foster learning and innovation in both formal and informal education. The 21st issue of the eLearning Papers proposes a broad approach to the theme of innovation in lifelong learning. In addition to looking at how innovation transforms current educational practice, this issue also considers how educational practice can support innovation in the greater socio-economic system, especially within the context of adult education and training. E-Learning in the university: When will it really happen? CommLab India launches a series of free, live, online web presentations that cover all aspects of eLearning. Join the first seven live webinars that focuses on best practices to resolve the fundamental disconnect between the SME and the eLearning development expert. It emphasizes topics such as the Roles & Responsibilities of the SME and eLearning Expert, Introduction to eLearning Process Flows, and shares eLearning best practices on this subject. With webinar registration you will receive complimentary Sample Storyboard templates, Project Plan templates, Sample feedback forms and more. I came across this really pertinent article by Lindsay Rayner. She is an adjunct reading instructor at Zane State College and is currently working toward a reading endorsement from The University of Toledo. As a teacher, I have a love-hate relationship with technology. I love that I can post student grades online. I hate that many of my students lack home computers to access those grades. I love that my students can use the Internet to conduct research. I hate that many of them instead use the Internet to commit plagiarism. Depending upon its use, technology has the potential to either be a great educational equalizer or yet another symbol of the divide between our richest and our poorest students. It can be either a valuable educational tool or a crutch for both teachers and students. Distance learning technology allows students to enroll in classes and even earn entire degrees without setting foot in a brick-and-mortar building. For instance, here in Muskingum County, high school students are taking courses in Chinese from teachers miles away. They are doing so without the expense of adding another full-time teacher, saving taxpayers' money and providing language skills that will help students succeed in a global economy. At Zane State, students are able to use distance-learning technology to complete bachelor's degrees at other colleges. 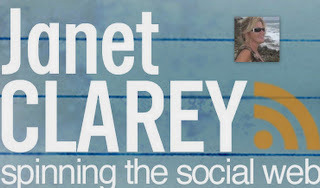 Check out this interesting talk with Janet Clarey below. Janet is a top educational consultant and an editor in Elearning! Magazine. She also maintains a blog, Spinning the Social Web. Janet is with Udemy to share her views on education and technology. Oddly enough it was an email from a former colleague, Tom Werner, at Brandon Hall Research. Tom and his wife had started a great wine blog and he said, “we should do this.” This came at a time when Brandon Hall Research was looking for a way to have a greater presence on the Web. So, I wrote my first blog post in February 2007 and was hooked. I find inspiration now from others’ content and comments. My blog is a great platform for personal learning too. At times, I find that it’s more valuable than my university classes. Actually, most of the time. Don't miss the talk with Janet! The e-learning Newsletter brings you news about current issues, open calls, forthcoming events and e-learning resources. Take a look at this interesting line-up below. Call for Papers: Training and work. Deadline October 8th. Today, a large part of learning takes place in a work environment, rather than in tertiary and post-tertiary education settings. In order to stay relevant and contribute to the human capital of future workers, learning needs to be tightly integrated into organizational work processes, allowing it to become a fundamental part of workers' and managers' everyday activities. A new European Union initiative. During the month of October, international youth mobility will be celebrated in all its forms. Budapest and Bordeaux will provide the stage for the launch of a major European initiative that seeks to encourage youth mobility in all fields of education, training, creation and solidarity-based commitment. These two cities and their community, educational and economic actors will come together for an event at which the dominant theme will be mobility for young people and the values that they represent. ICOPER is a best practice network that seeks to collect and further develop best practices for the design, development and delivery of interoperable content supporting competency-driven higher education. ICT 2010, Digitally Driven, 27-29 September 2010, Brussels (Belgium). Europe’s most visible forum for ICT research and innovation. This biennial event has become a unique meeting point for researchers, business people, investors and high-level policy-makers in the field of digital innovation. ICT 2010 will focus on policy priorities such as Europe’s Digital Agenda and the 2011-2012 European Union financial programme (€ 2.8 billion) funding research and innovation in ICT. ItworldEdu, 27-29 October 2010, Barcelona (Spain). ITworldEdu is the meeting point for professionals in the education and ICT sectors, an event at which they can learn, exchange ideas, find out about genuine case studies and experiences, make contacts, establish commercial agreements and present latest developments. Open Ed 2010, Seventh Annual Open Education Conference, 2-4 November 2010, Barcelona (Spain). The Open Education Conference has been described as “the annual reunion of the open education family.” Each year, the conference serves as the world’s leading venue for research related to open education, whilst simultaneously creating the most friendly and energetic atmosphere to be found at any academic conference. International Conference on Translation and Accessibility in Video Games and Virtual Worlds, 2-3 December 2010, Barcelona (Spain). The aim of the conference is to provide an interdisciplinary meeting point for all those interested in the fields of game localisation and accessibility, as well as accessibility and the role of translation in virtual worlds. This pioneering conference seeks to lay the foundations for future studies in these areas, provide a forum for discussion and enable industry and academia to meet and promote interdisciplinary research. ELSE 2011, 28-29 April 2011, Bucharest (Romania). The striking central theme of this event is: “Anywhere, any time - education on demand”. eLSE is an international conference, organised in order to promote eLearning-related activities by providing learning and professional development opportunities and pooling ideas from researchers, developers and practitioners in the fields of education, business and government to enable participants to learn, teach and share their experience. At what age can a child start using a computer? I just discovered these special reports via eMind - eLearning Professionals Group at LinkedIn by Stefanie Hemmingson. 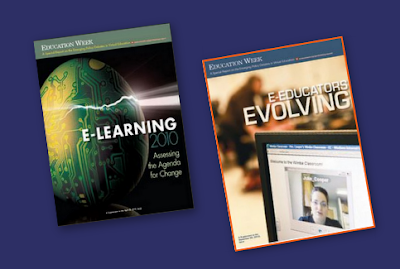 This is a three-part series on e-learning from Education Week. Education Week having a Sitewide Open House, September 20-24 and you can view all of the content free. This special report, the first in a three-part series on e-learning, aims to highlight the progress made in the e-learning arena, as well as the administrative, funding, and policy barriers that some experts say are slowing the growth of this form of education. It also examines the trends that are likely to force policymakers to re-examine the current rules of engagement for virtual learning. This special report, the second in a three-part series on e-learning, aims to answer questions related to the growing role of e-educators in K-12 education. It provides perspectives and advice from state policymakers and virtual school providers navigating through the new and often murky policy waters of online-only education, and features insights from e-educators in the trenches of vitual schooling. This event is scheduled for Thursday, September 23, 2 p.m. to 3 p.m. Eastern time. As virtual schools and courses gain traction and continue to grow, some experts say it’s imperative to recognize that online teachers need a special set of skills that are different from what their face-to-face counterparts need. Some virtual schools and states are adopting guidelines that require online teachers to respond to student e-mails within 24 hours and receive regular training on how to use new technologies for teaching online-only classes. Virtual schools are also honing their methods and procedures for evaluating online teachers, a process that can involve an extensive examination of how well the teachers communicate with students. Join two experts from the world of online education as they discuss the evolving guidelines for online teachers and how new evaluation practices can improve virtual teaching. Check out this this month's article by Andrea Gabor. She is a professor of journalism at Baruch College/CUNY and the author of several books, most recently The Capitalist Philosophers (Three Rivers Press, 2000). At City Polytechnic High School in Brooklyn some students take courses on engineering and architecture taught by college professors; they also can accumulate enough credits to graduate in just three years or earn an associate's degree in five years. The students can do all this because City Poly has divided the school year into trimesters, packing core requirements into a shorter time frame, allowing them to use the third trimester for less traditional classes. Across the city in Harlem, every student at Global Technology Preparatory, a middle school, receives a laptop at the start of the school year. They use them to develop Power Points for social-studies presentations, take online language classes, play math games and build a digital portfolio that the students will use in their high-school applications. This year, the school day also has been extended to 6 p.m. These new schools are part of the New York City Department of Education's innovation zone, a high-stakes gamble to reinvent New York City public schools. Launched two years ago as part of what has become the iZone, it originally included 10 schools and now has ballooned to 81. So far, the schools have shown promise by many measures, including attendance, student and parent satisfaction, and student progress toward graduation. The city now hopes to expand the iZone to 300 schools within the next few years. Some question, though, whether the Department of Education has the money to continue and expand the initiative. A dearth of research on kindergarten through 12 online education means that much of what the iZone is doing is highly experimental. And now, at the start of its third year, the iZone is undergoing a raft of changes that could unsettle the experiment -- and even help determine whether it succeeds or fails. Today I have Angelita Williams guest blogging. Please be sure to check out her unique guest post. Guest posts are always welcome, please contact me. Certain educators and students resist the idea of eLearning and distance education because it often goes against their traditional notions of what makes up a proper learning community: a physical classroom in which students and their instructors work together to solve problems and reflect upon their learning methods.Through collaboration, all members of the learning community gain an education. According to opponents of eLearning, this particularly humanist learning method cannot apply to computer-assisted learning, because technology, in their opinion, stands in the way of face-to-face communication. And of course, some will allow that technology can be used with this traditional pedagogy, but only as a supplemental tool. Fortunately, just as early twentieth century pedagogical practices, what Paulo Freire called "the banking concept of education," shifted according to the needs of nontraditional students, so too will twenty-first century pedagogical practices, especially now that technology has significantly improved within educational sectors. Consider this: according to the National Center for Education Statistics, during the 1999-2000 school year 27 percent of all American undergraduates were traditional and 28 percent were "highly nontraditional." Furthermore, these percentages represent an increase in nontraditional enrollment numbers from 1992-1993. I don't know the European numbers, but I do see a trend at work within the United States educational system. As their numbers increase, more nontraditional students will demand access to learning communities. As someone who has taught freshmen composition at several large American universities, I can offer anecdotal evidence that the few nontraditional students enrolled in my classes often voiced to me their concern about their ability to 'fit in.' While I did my best to help them adjust, I believe that an online community could have offered them an even better resource. An online learning community offers nontraditional students benefits similar to those the brick and mortar campus gives traditional students. Both allow the student to manage his or her schedule: a nontraditional student can use the internet to work around a full-time job, while the traditional student can schedule classes around his or her interests. Both communities give the student important resources: a nontraditional student can access many electronic databases, while the traditional student can go to the library or attend a lab session. And both communities give the student people with which to interact: the nontraditional student joins forums, video chats, and so on, while the traditional student sits in seminars and study groups. Of course, the differences exist in how the nontraditional student accesses that community. I suppose I could understand concerns that opponents raise about eLearning if technology continued to lag behind demand; however, technology has improved so much that eLearning cannot afford to ignore it. Technology, essentially, has helped us develop a solid eLearning pedagogy so as to better serve nontraditional students. This guest post is contributed by Angelita Williams, who writes on the topics of online college courses. She welcomes your comments at her email Id. Many thanks to Angelita Williams.